Est. 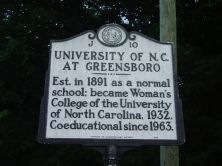 in 1891 as a normal school; became Woman's College of the University of North Carolina, 1932. Coeducational since 1963. The University of North Carolina at Greensboro has been known by several names since its founding in 1891. Established initially as a school for female teachers at the behest of educator Charles D. McIver, it opened as the State Normal and Industrial School. 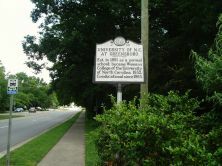 The school became the Woman’s College of the University of North Carolina in 1932, joining the University of North Carolina and North Carolina State College as part of the Consolidated University System. Becoming coeducational in 1963, the college was renamed the University of North Carolina at Greensboro. The State Normal School was founded in 1891 on ten acres in western Greensboro in Guilford County. The city allocated $30,000 for the construction of the first buildings, in addition to the initial $10,000 provided by the legislature. It opened in October 1892 with 223 students and 15 faculty members, under the direction of McIver as its first president. Originally, the School offered degrees in three departments: education, domestic sciences, and business. Although the State Normal School suffered setbacks in the early decades including an outbreak of typhoid fever and the destruction of the main dormitory by fire, it soon developed into a successful institution. McIver died in 1906, and was succeeded by Julius Foust, who served as president until 1934. Joining the Consolidated University System in 1932, it functioned as the leading college for women in North Carolina throughout the early twentieth century. In 1963 the University of North Carolina at Greensboro was established and the school became coeducational. It continued to widen its course offerings, and today hosts over 150 undergraduate and graduate programs in fields including education, liberal arts and business. The integration of men and minority students at UNC-G expanded and diversified the university in the 1960s and 1970s. In 1995 Patricia A. Sullivan became the first female chancellor of the University. The school now has around 14,000 undergraduates, seventy percent of those female.